I only started wearing make-up regularly last year. While I’ve now built up a good collection of make-up essentials, only a few things wind up traveling with me. The rest stay at home on top of my dresser. This kit is small and light enough for me to pack into my gym bag, but contains enough make-up options if I want to change my look. The only reason there are so many eyeshadows in there is I can’t bring myself to edit and only bring the ones I use for my everyday look. What if I need a smoky eye? What if I need to contour my nose and cheeks? In fact, the only reason this kit is this small is I hate carrying heavy bags. Otherwise, my packrat instincts come alive. I only have one set of brushes (made of the brushes from two smaller sets), so these slide into a separate compartment in my kit. I bought the majority of them from Landmark Department Store Trinoma (near the generic false eyelashes) and got them for less than P500 pesos. The brushes are soft but pick up product well — I really love them! 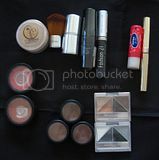 So if you see me walking down the street with a made-up face, this kit is the source of it all. What’s in your travel make-up kit?